ADRIAN HOTEL – 493 EDDY ST. & LAFAYETTE COFFEE SHOP – 250 HYDE ST.
1907. Architects: Salfield & Kohlberg. 5 stories, brick & terracotta facade, arcaded top story. Of all the photographs I have taken of the Adrian Hotel and the Lafayette Coffee Shop, this is one of my favorites. At first I thought it was simply because of the way the shot is composed, but on further reflection I realized that it is also because the composition shows nothing more recent than the Coca-Cola sign, making this image a real window into the past. BALBOA HOTEL – 120 HYDE ST.
c.1913. Designer unknown. 3 stories, stucco facade, paneled lobby, marquee intact. The Balboa Hotel is an unobtrusive building on Hyde Street, near Golden Gate Avenue. The ground floor of this building is taken up by a variety of small businesses — a restaurant, a laundry and a tiny convenience store. The hotel itself would be entirely unremarkable if it weren't for the beautiful stained glass marquee over its entrance. 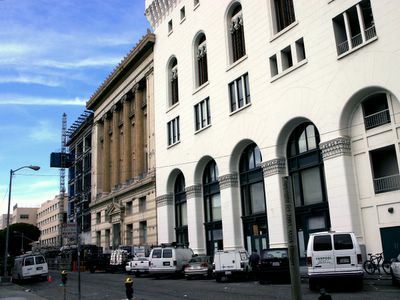 former YOUNG MEN'S INSTITUTE – 50 OAK ST. & former MASONIC LODGE – 25 VAN NESS AVE. The "Grecian temple" of what is now the S.F. Conservatory of Music's concert hall is flanked on the right by the old Masonic Temple. EMPRESS HOTEL – 144 EDDY ST.
(formerly Langham Hotel) 1907. Designer unknown. 6 stories, brick & galvanized iron facade, restored & remodeled entrance & lobby. 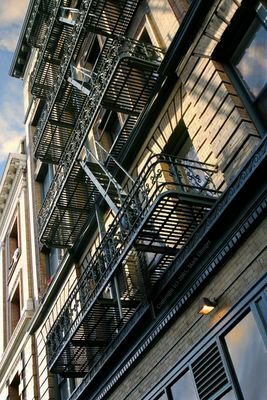 I love fire escapes and the Empress' fire escape is one of the finest examples of why this is so. Designed with care and craftsmanship, this fire escape actually enhances the classic beauty of the building's facade. Visible to the left is a corner of the William Penn Hotel. 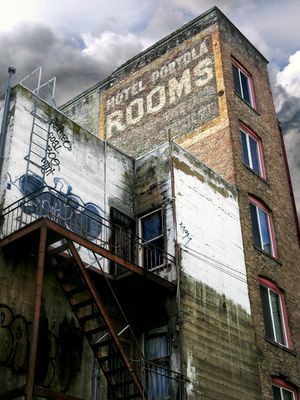 HOTEL FAIRFAX – 420 EDDY ST.
1907. Contractor: J. Klimm. 3 stories, stucco facade. This is one of the earliest photographs that I shot for this series. Note that the colors in this image are very simple; there is very little in the way of detail or nuance and the focus is very soft — all results of my unfamiliarity with the camera and lack of experience with Photoshop. I like this picture because the overall effect is very similar to the way I often see these signs when I am walking down Eddy Street — a patchwork of colors and shapes, somewhat blurred and with little apparent depth. Refer to Jefferson Marquee, a photograph that I took more than a year after this one in an attempt to improve upon an image that, for what it is, needs no improvement after all. For all of its problems, 6th Street has an unquenchable vitality. The day may be cold and rainy or warm and sunny, but the activity on the street remains constant. The weather was wet and blustery when I took this photograph. I liked the way the grime and soot, which for decades had accumulated on the window, imparted the look of a watercolor to the street scene below. LAWRENCE HOTEL – 48 6TH ST. This picture marks the beginning of my commitment to creating a visual record of San Francisco's central city neighborhoods, in particular the architecture and signage of its old residential hotels. The sign for the Lawrence Hotel became landfill a few months after I took this picture. 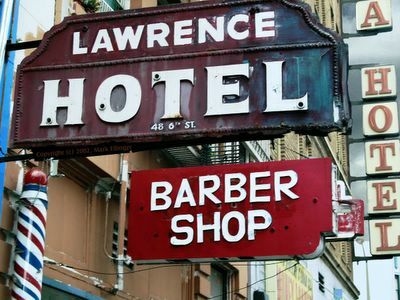 Visible behind the Barber Shop sign is a few inches of the old Desmond Hotel sign that was taken down a year later. People occasionally ask me why I don't take "after" shots, photographs of the way things now appear. My answer is that the results of modernization will be around for a long time, but history is being obliterated before our eyes. CAMELOT HOTEL – 124 TURK ST.
(formerly Hotel Portola; later Marathon Hotel, Lowell Hotel, Argue Hotel) 1907. Architect: Albert Farr. 6 stories, stucco facade, cornice stripped, base & entry altered. Another piece of vanished urban landscape is the rear of the Camelot Hotel, seen from Taylor Street about halfway between Turk and Eddy. Not long after I took this picture, TNDC built the Curran, low-income housing on Taylor St. Although no longer visible from the street, the rear wall of the Camelot and the side of the Drake Hotel, which faces Eddy St., now form the back of a lovely courtyard for the Curran. DAHLIA HOTEL – 74 TURK ST.
(formerly Hotel Taylor, later Hotel Thames) 1907. Architect: Norman R. Coulter. 4 stories, brick facade. A city's buildings and signs are its history, literally and figuratively. Our ability to relate to and understand the past is diminished when these links to our city's timeline are removed. Think of the importance of your personal keepsakes and mementoes. What are they but tangible links to someone or some place in time that you hold dear and wish to remember? 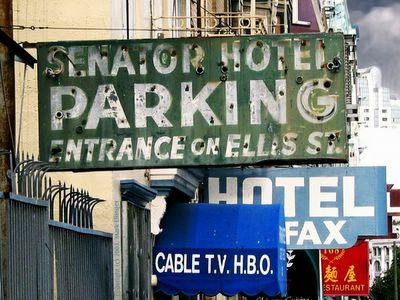 Though time-worn and neglected, this sign was a piece of Tenderloin history; now gone, forever. 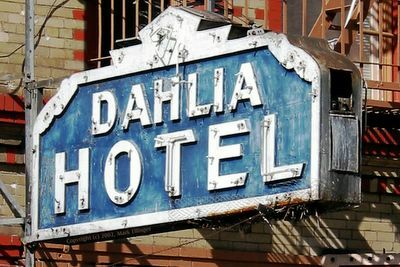 "When hotel men tried to get the Dahlia Hotel at 74 Turk St. closed, they said it was a vice resort with 10 girls. Mayor Rossi's secretary said: 'You run your hotels and we'll run the rest,' they declared." MARATHON HOTEL – 710 ELLIS ST.
(formerly Marathon Apartments). 1907. Architects: Crim & Scott. 4 stories, pressed brick facade, base altered, entry intact. The rear of the Marathon reveals the dilapidated condition of the building. I have conflicting reactions to this image; I love the complex colors of the mossy wall and the disintegrating window frames and screens, but I shudder to think of what might happen to the building and its many residents in a high-magnitude earthquake. 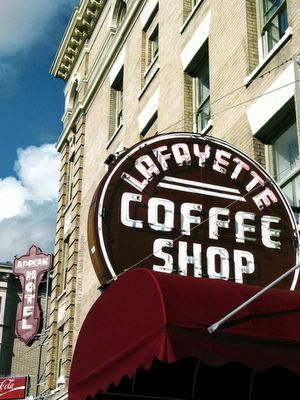 LAFAYETTE COFFEE SHOP – 250 HYDE ST. 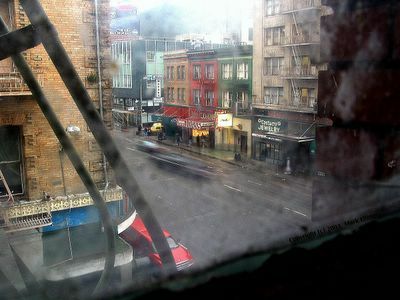 The Lafayette Coffee Shop is the diner of choice for many people living in Tenderloin residential hotels. What makes this diner so attractive to me is its signage and interior decor, which have remained largely unchanged for nearly half a century. At night, in its blaze of neon lights, the Lafayette looks very much like a carnival midway attraction. OASIS APARTMENTS – 351 TURK ST.
(formerly Y.M.C.A. Hotel) 1928. Architect: Frederick H. Meyer. 13 stories, brick facade, fine terracotta decorations in Byzantine style, new door. This view of the Oasis clearly shows the artifice of its architecture. The colonnade is a deception, used to relieve the starkness of what would otherwise be just tall, rectangular boxes of red brick.